Recently, we received an excellent personalised Penwizard book for Blake! Blake will be 3 in a few weeks time (can you believe it! 3 already!) and the topic of birthdays has been a hot one! Blake is extremely excited and knows all about cake and gifts! 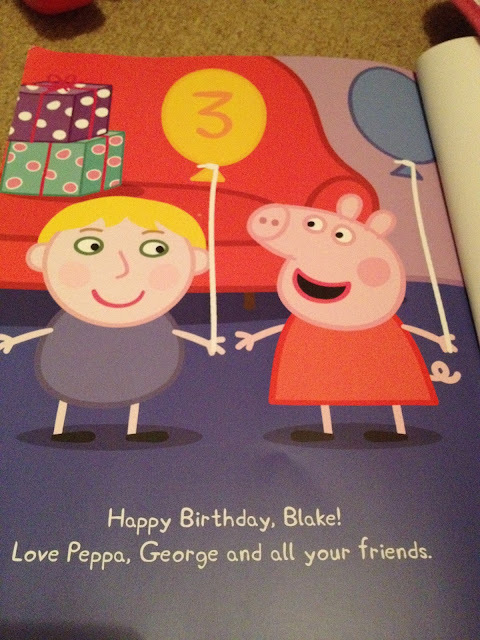 The personalised book "Peppa Pig Comes To Your Child's Birthday Party" from penwizard is really great - when you order it online, you can personalise it for your child - so the character in the book reflects your child. We customised eye colour, skin tone, hair colour and hair style. The personalisation options are really simple and quick to select and use. We also customised the balloon to show Blake will be 3 and added a dedication message inside the book. I recognised that the story in the book had been taken from the episode of Zoe Zebra's birthday - incidentally one of Blake's favourite episodes! Blake is a big fan of Peppa and George so was really excited by the story and recognised himself as the character in the book. 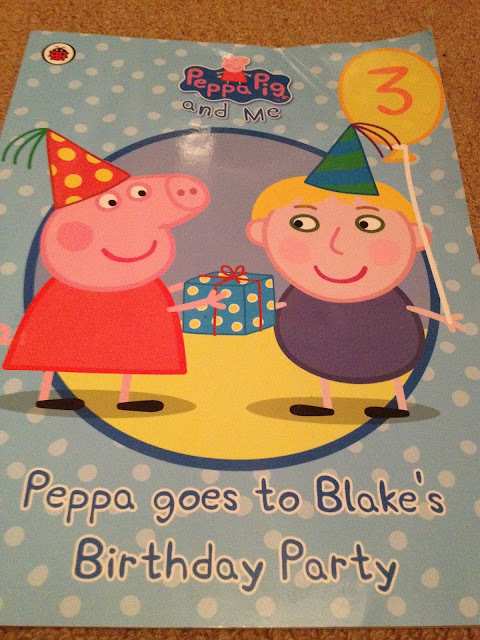 "On his birthday your child gets to share his day with Peppa Pig and George, starring in the words and pictures of his own personalised birthday book. The three of them deliver party invitations with Mr. Zebra in his van before being joined by Suzy Sheep, Danny Dog, Rebecca Rabbit, Pedro Pony, Emily Elephant and Candy Cat at your child very own party. Personalised books are a perfect gift and a great way of getting your kids involved and excited about reading as they hear and read their name and see themselves on the pages of the book in the Peppa Pig illustrations. " It's a large 21 x 28cm size glossy cover paperback with vibrant colours and great printing quality - it arrived much quicker than I expected it to and is already a firm favourite! We've read the book a lot as it helps Blake understand birthdays and what to expect on his 3rd birthday next month. I'd recommend this story to other Peppa fans, particularly in the run up to a birthday for curious little minds! My only niggle? I would have liked to have been able to add a sibling into the Peppa story too. Penwizard are offering all my lovely readers Free Postage on all personalised books (They have lots to chose from) - use code 150920 at checkout. Thanks for sharing. I would love to take this amazing book for my youngest sister. She loves peppa pig. We love the Brio Dachshund from Hello Baby!